The mechanical brakes or electric brakes can be used to bring an electric motor to rest, quickly. But with the mechanical brakes, smooth stop is not possible. Similarly the linings, levers and other mechanical arrangements are necessary to apply mechanical brakes. Mechanical brakes also depends on the skill of the operator. 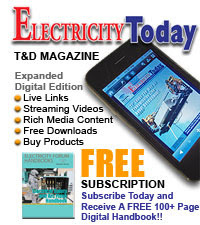 As against this, an electric braking is easy and reliable hence it is used to stop the induction motors very quickly. Though the motor is brought to rest electrically, to maintain its state of rest a mechanical brake is must. In rheostatic braking, one supply line out of R, Y or B is disconnected from the supply. Depending upon the condition of this disconnected line, two types of rheostatic braking can be achieved. 1. Two lead connections : In this method, the disconnected line is kept open. This is shown in the Fig. 1(a) and is called two lead connections. 2. Three lead connections : In this method, the disconnected line is connected directly to the other line of the machine. This is shown in the Fig. 1(b). 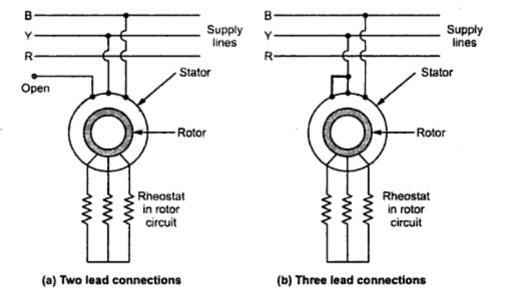 In both cases, a high resistance is inserted in the rotor circuit, with the help of rheostat. 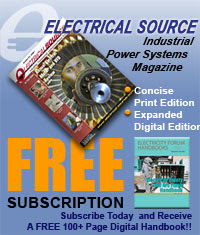 Note : Thus this method is effective only for slip ring or wound rotor induction motors. As one of the motor terminal is not connected to the supply, the motor continues to run as single phase motor. In this case the breakdown torque i.e. maximum toque decreases to 40% of its original value and motor develops no starting torque at all. And due to high rotor resistance, the net torque produced becomes negative and the braking operation is obtained. In two lead connections, the braking torque is small while in three lead connections, The braking torque is high at high speeds. But in three lead connections there is possibility of inequality between the contact resistances in connections of two paralleled lines. This might reduce the braking torque and even may produce the motoring torque again. Hence inspite of low braking torque, two lead connections is preferred over three lead connections. 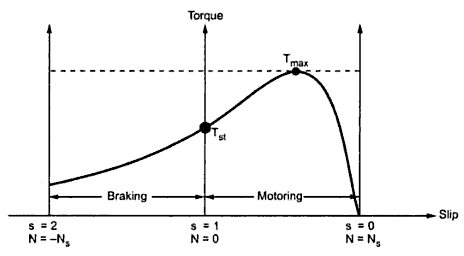 The torque-slip characteristics for motoring and braking operation is shown in the Fig. 2. Note : Such a dynamic or rheostat braking is used mainly in crane hoist. The reversal of direction of rotation of motor is the main principle in plugging of motor. In case of an induction motor, it can be quickly stopped by interchanging any two stator leads. Due to this, the direction of rotating magnetic field gets reversed suddenly. This produces a torque in the reverse direction and the motor tries to rotate in opposite direction. Effectively the brakes are applied to the motor. Thus during the plugging, the motor acts as a brake. Note : The method can be applied to both squirrel cage as well as wound rotor induction motors. Note : The plugging produces very high I2R losses in the rotor which are more than those produced when rotor is locked. The plugging should not be done frequently as due to high heat produced rotor may attain high temperature which can melt the rotor bars and even may over heat the stator as well. Note : In some industrial applications where quick stop of motor and its load is necessary, the plugging method is used.